Rama Navami , the 9th day of the Shukla Paksha (waxing phase of the Moon or bright fortnight) in the Tamil month of Chithirai (Mar- Apr) is celebrated as the birthday of Lord Rama, the arrival of the divine power on the earth plane. This day is also known as Chaitra Masa Shukla Paksha Navami and it falls on the last day of the Chaitra Navaratri (Vasant Navaratri) celebrations. This is the time to inundate ourselves with the spirit of Lord Rama. Lord Rama is none other than Lord Vishnu and he is the 7th incarnation and is one of the widely worshipped Gods by the Hindu community. One of the greatest epic Ramayana unfolds the story of Lord Rama highlighting his characters, virtues and morals. He was beautiful, gentle, soft-spoken, well- accomplished, possessed royal traits and selfless. His fame, skills, valor and proficiency had no limits and were matchless. He was filled with compassion and an embodiment of humanity. He was an epitome of love, an ideal son, brother, husband, friend and king. He is the personification of all the highest ideals of man. As a responsible King of Ayodhya, the character of Rama represents the glory of sacrifice and honesty. Lord Vishnu took birth in this earth plane as Lord Rama in order to establish righteousness, defeat and destroy the evil forces and protect his devotees. The noblest teaching highlighted in the Ramayana is the paramount significance of righteousness in every human being’s life. Righteousness is the first step of spiritual evolution and nurturing this trait over a period unfolds the underlying divinity in a man. It is believed that the incarnation of Lord Vishnu in the human form as Lord Rama, is to institute or demonstrate the importance of the path of righteousness. According to the epic Ramayana, during the Treta Yuga, Dasarath the king of the ancient Kingdom of Ayodhya lived with his wives Kausalya, Sumithra and Kaikeyi. To his dismay, he was childless or did not have an heir. The great sage Vasistha advised Dasarath to perform the Putra Kameshti Yagna to be blessed with a child. As per his advice, the king performed the yagna by trained Vedic pundits in the presence of special invitee Maharishi Rishyasringa. At the end of the Yagna, Yagneshwara gave king Dasarath, a bowl of divine porridge and asked him to distribute it to his wives. After few days, the queens got conceived. On the Navami (at 9th day) in the Chaitra month at noon Kausalya gave birth to Rama, Kaikeyi to Bharata and Sumitra to twin boys named Lakshmana and Shatrughna. This day is celebrated as Sri Rama Navami. On the day of Rama Navami, devotees offer their prayers to Lord Rama and also observe fast. As a tradition or practice, first prayers are offer to Sun god, as Lord Rama belongs to the Surya Vamsh (Sun dynasty), which is also called as Raghu Vamsh. As the Sun represents light and power, devotees worship the Sun god to gain his blessings and to fill their lives with his divine light. People sing bhajans in the name of Lord, chant Rama Nama and read Ramayana. Chanting of Vedic hymns is an important part of the celebrations. Devotees undertake fasting to overcome all obstacles in life and find happiness in the material world. Fasting on this day can also help to purify soul, mind and body. 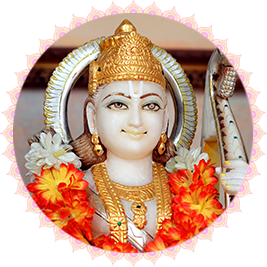 Sri Rama Navami Vrat (fasting) is one of the important practices followed by the Hindus. Many devotees observe a day long fasting from the morning. Some people follow a liquid diet on that day and some may prefer to have a one-time meal. Food items like potatoes, garlic, ginger, onion etc. are generally avoided during fasting. Some people consume only fruits. Lord Vishnu is the preserver and protector of the universe and one among the Trinity. Performing a sacred homa to Lord Vishnu can bestow you with wealth,..